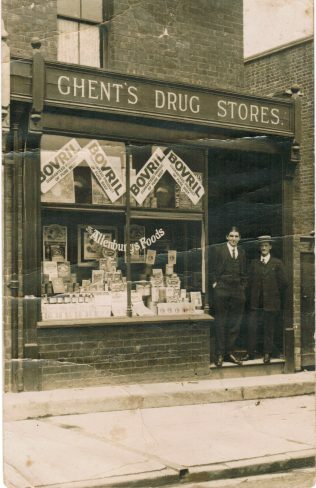 Hi, attached is a picture postcard of my grandfather’s Drug Store with him (tall man) and another man standing in front of the shop. The date on the card is 1910 and it was posted in Gloucester by my grandfather Stanley Henry Ghent to his mother in Clifton, Bristol. The shop facade reads ‘GHENTS DRUG STORES’. We visited this site in 2005 and noticed that it was still operating as a Chemist shop (Barkley Chemist), but since then it is a take away food shop. My grandfather’s father was a William Hewitt Ghent that was the Head Butler at The Gloucester Club in Westgate Street. You can click on the image to see a larger version of it.